Tiny’s Friend Do-Boy Helps the A.S.P.C.A. Tiny the Tree Frog loves other animals. In fact, one of his best friends is Do-Boy the dog. 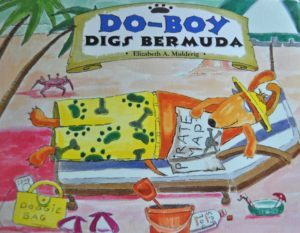 And one of his favourite bedtime stories stars Do-Boy, entitled, ‘Do-Boy Digs Bermuda’. This is a treasure hunt story and Tiny loves a good treasure hunt! However, Tiny is aware that there are dogs and cats in great need of love and care at the A.S.P.C.A. and has been donating a portion of the proceeds of Tiny book sales to that charity for over ten years. The A.S.P.C.A. is Tiny’s favourite charity and he would someday like to adopt a pet dog or cat. But in the meantime, giving money every month to these animal shelters makes him feel like he is helping to feed and shelter many future pets for wonderful, animal loving people! Find out how you can help the A.S.P.C.A here! Check out ‘Do-Boy Digs Bermuda’ — where a portion of every book sold goes directly to the A.S.P.C.A.